Slotted drawer slips - Why? Spotted this today on a genuine A & C cabinet in oak. I cannot see any reason for the diagonal cuts through the drawer slips, front and sides. Re: Slotted drawer slips - Why? But there isn't any cross grain joint. I wondered if it was to wipe the dust off the runners:) but even that would not apply to the front. I've seen it in a book somewhere, but a quick flick through the shelves hasn't turned anything up. My 105yr old built in units have exactly the same cuts on the underside of the slips and I've seen it on a few pieces. I'd have gone for the grain thing too . Is it of any relevance that on the sides the cuts run in the same direction per side, yet on the front one of the cuts is in a different direction? I thought I saw the light at the end of the tunnel, but it was some b*stard with a torch bringing me more work! could it be that you fill them with wax and they self lubricate over time??? I've got some too. It's a variety of rubbed glue block. They allow for a little movement but if the worst comes to the worst they'll detach either from the side or from the bottom but probably not both so they'll stay in place and function as a slip. It's the slip function which is the most important as they double up the bearing width onto the runner. I think (they'd think) the diagonal joint will travel over any bumps more smoothly. They'd do the front edge the same for no reason other than continuity. Just guessing really. Good quality stuff is very often cheaply made or finished below, behind, out of sight. Arts n Crafts stuff often oddly made as they were busy re-inventing techniques and ignoring the great tradition. 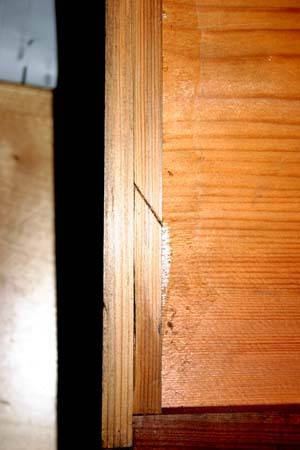 Short rubbed glue blocks are used a lot inside carcases and under stairs. It's a quick and easy way of toughening things up. With hot glue they stick more or less instantly with no fixing or clamping. Works with PVA if you hold each one for a few seconds for the glue to grip. Still a puzzle to me. Why on earth would you change the direction of the cut on the front slip? This was top drawer A & C, supposedly the upper fixed point of construction perfection. modernist wrote: Still a puzzle to me. Why on earth would you change the direction of the cut on the front slip? No reason at all, just doing it the same as the sides. Thats what they thought/said but in fact this is a cheapo detail, as is the slotted screw fixing at the back edge. An improvement on slot only, inferior to a proper slip. 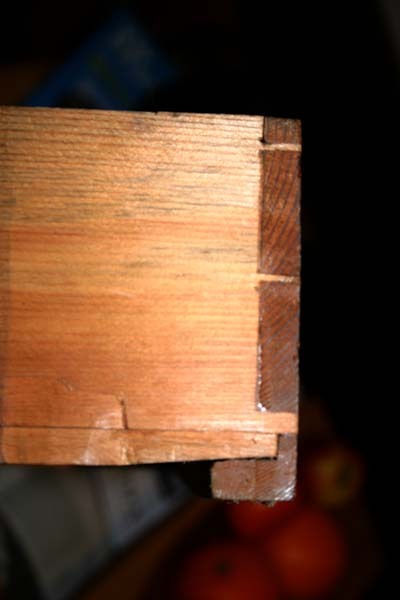 The bottom slot is very fragile and thin sided but the slips/blocks take much of the load and wear. Better than no blocks , not as good as proper slip, but cheaper. The dovetails are pleasingly rufty tufty! Same reason you soldier slotted screws maybe ? No reason it just looks better . I think they just did it the same as the sides because that's what they were doing. My drawer has just one glue block at the front, so a little more thought has gone into it. My drawer also has tacks through the bottom into the back. These are redundant as if there was any movement in the bottom it'd pull out at the front instead. I wonder if these were added by a DIY householder (my old dad perhaps) thinking that they had been left out by mistake. The A&C slotted screw detail is even worse as movement would be likely to split off the bottom between the screws, if it didn't pull out the front edge first. 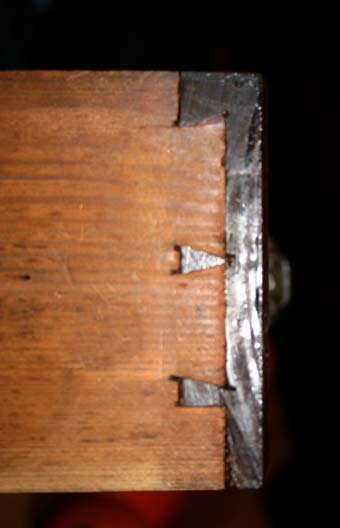 I had assumed that this method of cutting the glue blocks was intended to avoid poor running and noise (think railways) caused by the blocks sliding on the bearers, either as a result of wear in the drawer side or because they are intended to bear some of the weight. 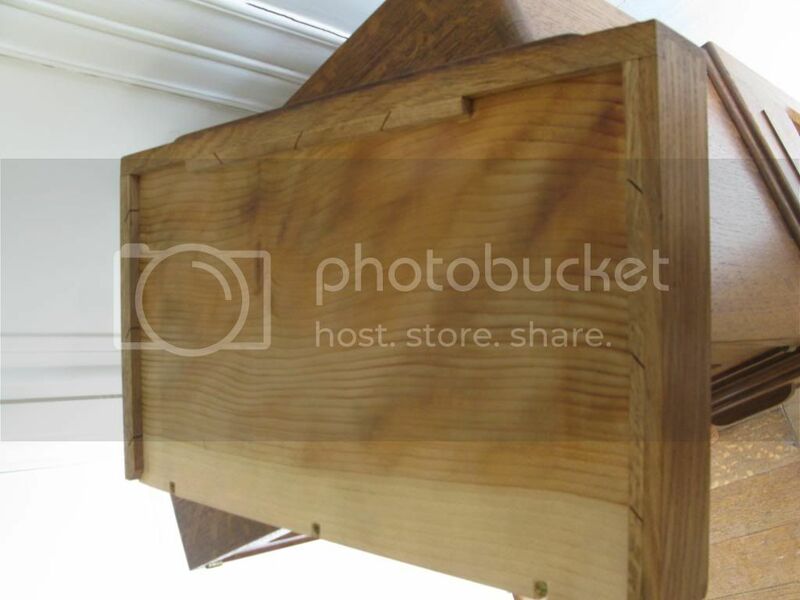 This seems to be supported by the photos which seem to show the blocks level with the bottom edge of the drawer side. The front blocks may be just a case of why make two shapes of block for each drawer? It hadn't dawned on me when I looked at it that they were only blocks not full slips. They probably made them by the boxful and glued them on in seconds. It's a bit poor for top end A & C work. modernist wrote: It hadn't dawned on me when I looked at it that they were only blocks not full slips. They probably made them by the boxful and glued them on in seconds. It's a bit poor for top end A & C work. 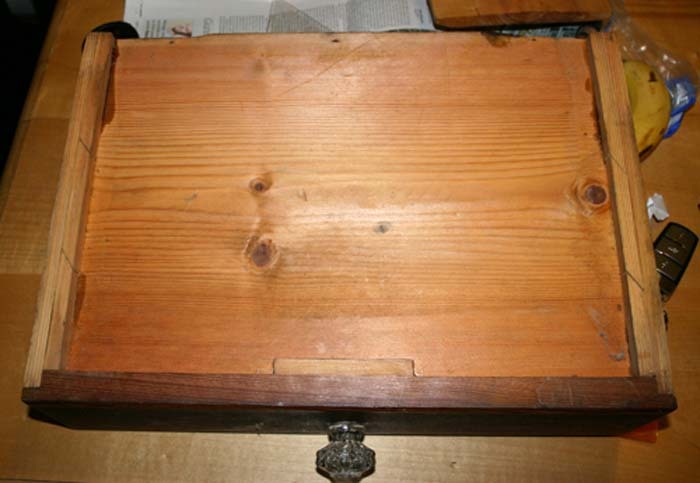 On the example I have, the drawer bottom is in a groove in the side, the strip is a continuous runner which is glued on. Interestingly, the diagonal cuts don't go all the way through the strip there's a mm or two left holding it all in one piece. My conclusion is that these strips are just to give more wear area on the running surfaces, the cuts are to allow expansion of the bottom and the reason for making them diagonal is so they don't bind on the case as they might is they were straight across. How about this for an idea? Wax was pressed into the slits so the drawers became self lubricating! If they are glued two faces, as Jacob has observed, and was the case on my example how can the bottom move? modernist wrote: If they are glued two faces, as Jacob has observed, and was the case on my example how can the bottom move? This wasn't in a pub back room but Blackwell House on Windermere, currently full of Baillie Scott furniture. Not only can I not understand it but it must have been "approved practice" to be used on a piece like that. Ro tells me I was recorded on th CCTV taking the forbidden pic! I was staying in a hotel in Ambleside that had once been a grand Regency house. 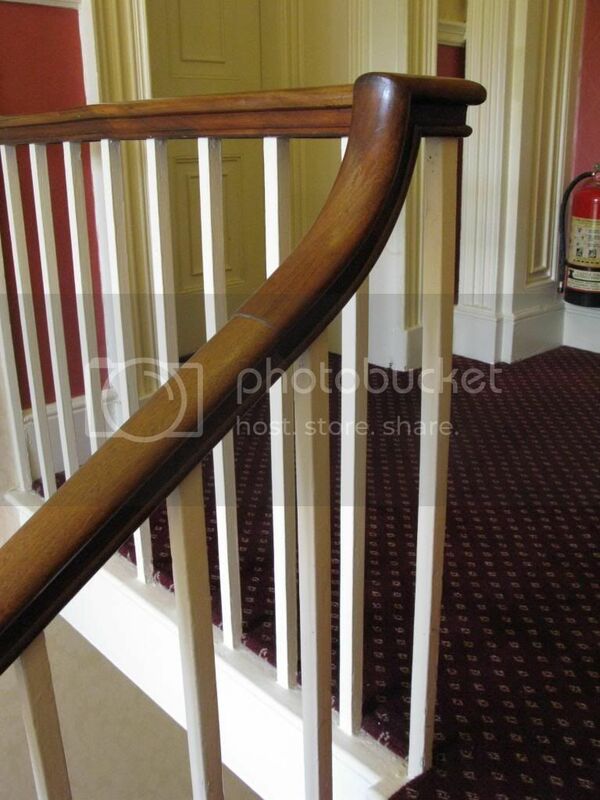 The servants must have been shorter then as the (rather nice) banister was only 700mm above the edge of the stair. Dunno you got me there. Perhaps forget movement! Maybe they are not glued to the side and take up movement by being short lengths. If so it's an odd way of doing it. There must be a logical explanation of 3 of us have found examples in different places. That makes sense. 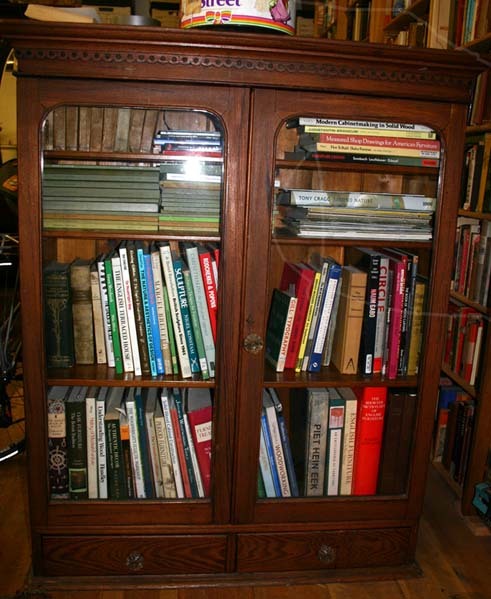 With thin sides and well fitted drawers, movement in a relatively stout slip could cause the sides to bend. So, the kerfs are to weaken the slip so that it conforms to the already planed to fit drawer sides. It's a very smart drawer with cedar bottom so I can't imagine anyone being allowed to skimp. Another thought. These drawers were typically fitted before the bottom was installed, supported over a board overhanging the bench while planed to fit. The slips, as a stock item, would have been prepared in long lengths by the dozen and used from the shelf as required. It would be inevitable that some would be bowed in length by the time they were being used. I'm guessing that, having planed a drawer to perfection, they found problems after gluing on the slips and came up with slotting them as a solution.